Reims (sometimes spelled as "Rheims" in English) is a city in the Champagne-Ardenne region of France, lying about 90 miles (144 kilometers) to the East-Northeast of Paris. As of the 1999 census, Reims had a population of 187,206, with 291,375 people living in the metropolitan area. Reims (sometimes spelled as "Rheims" in English) is a city in the Champagne-Ardenne region of France. Reims is located about 90 miles (144 kilometers) to the East-Northeast of Paris. As of the 1999 census, Reims had a population of 187,206, with 291,375 people living in the metropolitan area. People from Reims are known as Rémois (males) or Rémoises (females). 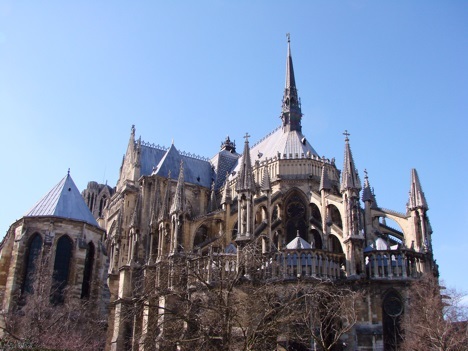 Reims is believed to have originally founded by a tribe of Gauls known as the Remi, in around 80 BCE. During Julius Caesar's conquest of Gaul, the Remi allied themselves with the Romans, and thus gained special favor from the Roman Empire. During the barbarian invasions of the Roman Empire in the 5th century, Reims was attacked by the Vandals (in 406), and by Attila the Hun (in 451). Evidence of Reims' Roman history can be seen in the Mars Gate (French: Porte de Mars). This is a triumphal arch dating from the 3rd century, and is 108 feet (32 meters) in length by 43 feet (13 meters) in height. The Mars Gate was the widest arch in the Roman world. 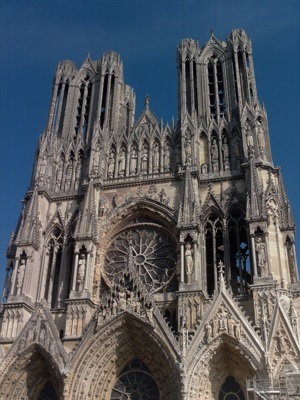 Christianity has been established in Reims since at least 260, and Reims was the site where King Clovis I of the Franks converted to Christianity. The archbishop of Reims consecrated the Kings of France for many centuries, from Philippe II Augustus (anointed in 1179) to Charles X (anointed in 1825). Reims is the site of Reims Cathedral, the place where French Kings were traditionally crowned (it served a similar role to Westminster Abbey in the United Kingdom).